The system is rigged: America's political leadership remains overwhelmingly white, male, moneyed, and Christian. Even at the local and state levels, elected office is inaccessible to the people it aims to represent. 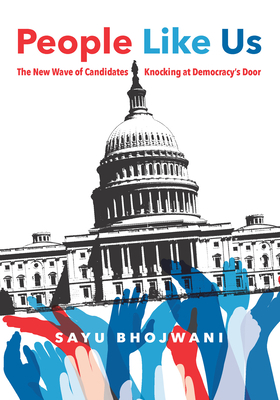 But in People Like Us, political scientist Sayu Bhojwani shares the stories of a diverse and persevering range of local and state politicians from across the country who are challenging the status quo, winning against all odds, and leaving a path for others to follow in their wake. In Anaheim, California, a previously undocumented Mexican American challenges the high-powered interests of the Disney Corporation to win a city council seat. In the Midwest, a thirty-something Muslim Somali American unseats a forty-four-year incumbent in the Minnesota house of representatives. These are some of the foreign-born, lower-income, and of-color Americans who have successfully taken on leadership roles in elected office despite xenophobia, political gatekeeping, and personal financial concerns. In accessible prose, Bhojwani shines a light on the political, systemic, and cultural roadblocks that prevent government from effectively representing a rapidly changing America, and offers forward-thinking solutions on how to get rid of them. People Like Us serves as a road map for the burgeoning democracy that has been a long time in the making: inclusive, multiracial, and unstoppable. Sayu Bhojwani is the founder and president of New American Leaders, the only national organization focused on preparing immigrant leaders to run for public office. She served as New York City's first commissioner of immigrant affairs and lives in New York.